Situated in the heart of Loch Lomond National Park, these stunning holiday properties (refs SVVE, SXXO [Chestnut Cottage], SXXP [Willow Cottage], SXXQ [Primrose Cottage], SXXR [Ivy Cottage]) have been lovingly restored and furnished to provide wonderful retreats. Auchendennan Farm Cottage (SLLX) is a single-storey holiday cottage; within the house there is a large family sauna which can be used as an ideal way to unwind. Outside on the sun decking, there is a sunken hot tub which is large enough for all the family and powerful enough to give tired muscles a proper massage. Rose Cottage (SRRG) is a single-storey conversion adjoining the owner’s farmhouse. Combining modern and traditional furnishings, the property boasts a superb hot tub and external sun decked area for relaxing and unwinding. Burnbeag (SVVE) is a stunning, detached cottage to the rear of the steadings and has a stream running through its private enclosed garden, which has a decked area, pond/fountain feature and hot tub. Courtyard Studio (SVVD) is a modern, single-storey barn conversion set in the courtyard, behind the main house. 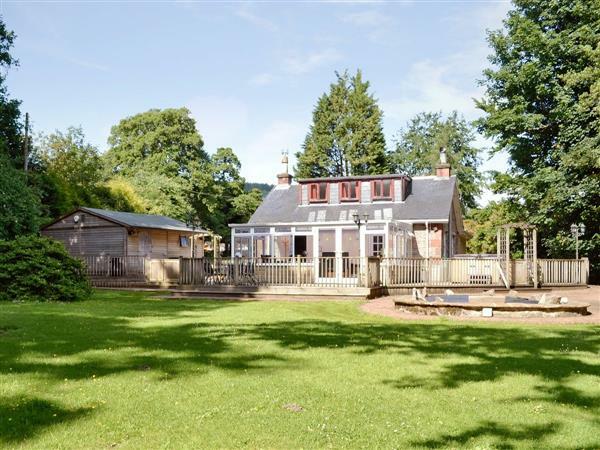 Large living room with open fire, sofa bed (for alternative sleeping only), French doors to large dining conservatory overlooking garden, and well-equipped kitchen area with wooden floor. Double bedroom with 5ft bed and en-suite shower room with toilet. Twin bedroom. Bathroom with over-bath shower, bidet and toilet. Spiral stairs from living room to first floor: Large twin bedroom with additional single bed (for +1). For a better idea of where Auchendennan - Burnbeag is, you can see Auchendennan - Burnbeag on the map below. Do you want to holiday near Auchendennan - Burnbeag (SVVE), you can see other cottages within 25 miles of Auchendennan - Burnbeag; have a look to find your perfect holiday location.